What will my child look like? 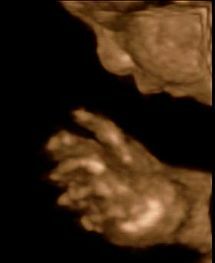 The three-dimensional imaging offered by ultrasound investigations produces fascinating pictures of your child. 3D is actually "live 4D", since you can actually see your child moving in 3D! When the conditions are right, the child's face looks close enough to touch, and even expressions can be recognized. Hands and feet, and sometimes even their spine, can be visualized. The best time: There are 2 options that many patients now use: Around the 16th week, it is possible to see the "whole child" in action, moving around in the womb. Between the 20th and 30th weeks of pregnancy, good close-up pictures can be obtained of the face, hands and feet if they are adequately surrounded by amniotic fluid. Of course, the quality of the images also depends on your child's "cooperation". The investigation is as harmless to the baby as any "normal" two-dimensional investigation. Optional service: The 3D scan during pregnancy is unfortunately not a standard service provided for by statutory insurance companies. We offer the 3D scan as an optional service, and you can find out more about how much it costs when you register. After the scan, you will be given a CD containing still photos and video sequences, from which you can print further individual pictures if you wish. To ensure we have enough time, generally between 15 and 20 minutes, we allocate appointments for a 3D scan at the end of our consulting sessions. or call +49 (0)89 1293229. You can inquire about costs when you register.